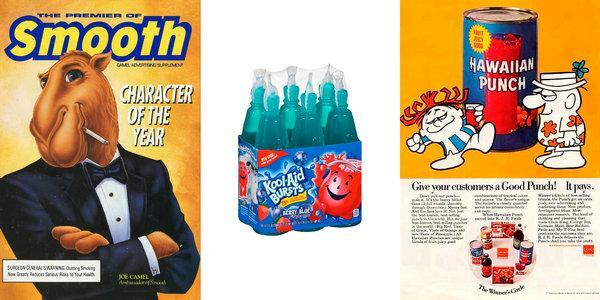 What do these ads featuring Joe Camel, Kool-Aid Man and the maniacal mascot for Hawaiian Punch have in common? All three were created by Big Tobacco in the decades when cigarette makers, seeking to diversify their holdings, acquired some of America’s iconic beverage brands. They used their expertise in artificial flavor, coloring and marketing to heighten the products’ appeal to children. That tobacco companies once sold sugar-sweetened drinks like Tang, Capri Sun and Kool-Aid is not exactly news. But researchers combing through a vast archive of cigarette company documents at the University of California, San Francisco stumbled on something revealing: Internal correspondence showed how tobacco executives, barred from targeting children for cigarette sales, focused their marketing prowess on young people to sell sugary beverages in ways that had not been done before. The archive, known as the Truth Tobacco Industry Documents, was created as part of a settlement between major cigarette companies and states that were seeking to recoup smoking-related health care costs. The researchers published their findings on Thursday in the medical publication BMJ. Using child-tested flavors, cartoon characters, branded toys and millions of dollars in advertising, the companies cultivated loyalty to sugar-laden products that health experts said had greatly contributed to the nation’s obesity crisis. At a time of mounting childhood obesity, with nearly a third of children in the United States overweight or obese and rates of type 2 diabetes soaring among adolescents, the study’s authors said it was important to chart how companies created and marketed junk food and sugary drinks to youngsters. R.J. Reynolds and Philip Morris no longer own the drink brands and declined to comment, as did the companies that later acquired the brands. Experts said tobacco executives had a keen appreciation for the importance of earning customer loyalty at an early age. Jennifer Harris, who studies corporate marketing at the Rudd Center for Food Policy and Obesity at the University of Connecticut, said introducing sweetened beverages to young children can have lifelong implications. Before its atomic red, sweet bouquet came to dominate school cafeterias and birthday parties nationwide, Hawaiian Punch was sold as a cocktail mixer for adults and came in only two flavors. After purchasing the brand in 1963 from the Pacific Hawaiian Products Company, R.J. Reynolds rebranded the beverage for children, according to company documents. Executives expanded the repertoire of flavors to 16, and discontinued Amber Apple, a product favored by mothers, after taste tests with children found they preferred Red Apple. That same year, R.J. Reynolds introduced pop-top eight-ounce cans — “perfect for children,” according to company documents — that provided an alternative to the mammoth 46-ounce metal canisters that had to be punctured by a grown up, armed with a can opener. By the 1980s, the brand was pulling in $200 million annually, with growth fueled by the introduction of child-friendly juice boxes (“A handy little carton that comes with its very own straw,” promotional material said.) as well as Hawaiian Punch as a shelf concentrate, a frozen cylinder and powders that could be mixed with water. Flush with cash, and with the prospect of government regulation mounting, cigarette companies accelerated their purchase of food and beverage companies. In 1985 Philip Morris, impressed by R.J.R.s success with Hawaiian Punch, applied the same marketing techniques to Kool-Aid, which it acquired when it bought General Foods, according to company documents. For decades, Kool-Aid had been sold in powder form as a cheaper alternative to soda, with ads aimed squarely at penny-pinching housewives. Philip Morris quickly shifted gears by halving its advertising budget for mothers to $10.7 million, and more than doubling the amount spent on children’s marketing to $6 million, according to company figures. The mascot, Kool-Aid Man, was an anthropomorphized glass pitcher who was fond of crashing through walls and fences, sending terrified adults into goofy pratfalls. The following year, Philip Morris introduced a loyalty swag program, Wacky Wild Prize Warehouse, modeled on the Marlboro Country Store, which rewarded frequent smokers with branded camping gear, clothing and poker sets. In 1992, a Philip Morris marketing analysis described Wacky Warehouse — a collaboration with toy makers like Nintendo and Mattel — as “the most effective kid’s marketing vehicle known.” By then, Kool-Aid had expanded into a dizzying constellation of frozen pops, bursts, jammers and shots that came in dozens of flavors like Great Bluedini, PurpleSaurus Rex and colors that changed when mixed with water. The solution: Rebrand Tang for young adolescents. The company unleashed a wave of television ads that positioned Tang as an “extreme orange breakfast drink for today’s extreme tweens.” The ads featured orangutans on motorcycles and sleepy teens zapped awake by a glass of sugary Tang. The company forged marketing arrangements with Sports Illustrated and Schwinn bicycles and created a loyalty program to rival the Wacky Warehouse. Philip Morris and R.J. Reynolds no longer own drink brands, having sold them or spun them off over the past two decades. Tang ended up in the portfolio of the snack food giant Mondelez International, which owns such brands as Oreo, Cadbury and Nabisco. Tang may have lost some of its pizazz in the United States, but it still has broad appeal overseas, especially in the developing world, where it has been creating new flavors to appeal to local tastes. According to the company’s website, Tang brought in $900 million in 2016.